We strive to partner with all industry stakeholders to better prepare them and ourselves to minimize the impact of an incident. Ardent is also committed to draw lessons learned from the situations we are involved in to prevent future incidents. Ardent believes in preventative safety. We believe in preserving the safety and well-being of all maritime personnel, quality of the environment, value of property and the reputation of our industry. We offer innovative solutions to salvage situations and a proactive approach of partnering up with the industry before a casualty happens. 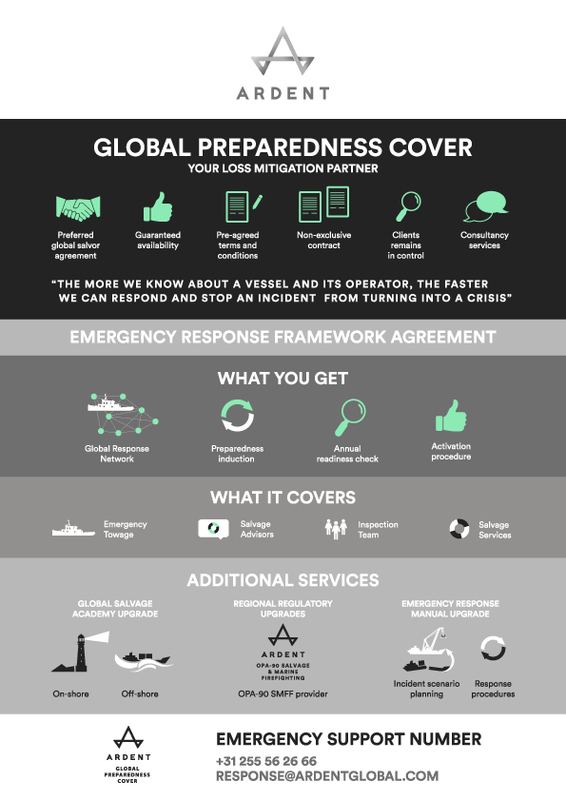 Ardent aims to be the maritime industry’s long-term loss mitigation partner. Partnering will save time, reduce cost and mitigate the environmental impact of marine incidents. Ardent works closely with our partners to build processes that prevent future loss of lives, damage to facilities and assets or damage to the environment. Today’s volume of shipping, and the increasing size and complexity of vessels, mean that any incident has the potential to be serious, complex and costly. Ardent’s proactive, risk-mitigating approach to operations is the solution to help minimize the impact of an incident at sea. The Ardent Salvage Academy offers relevant expert training to every shipping industry professional, from the shore side to officers to ship owners and insurers. They learn how to respond and be prepared to deal with the stress of a marine casualty situation. We put decades of shipping experience to work for you, increasing readiness by offering framework agreements based on our knowledge of particular risks along your trade routes. We work with shipowners, assets owners and operators, including some of the world’s largest shipping companies, leading insurers and oil companies – to get to know their vessels, to work together on incident prevention and to work out a plan of action in case an incident occurs. In situations where time is crucial, that can save valuable hours – and make a huge difference to their businesses. For more information please contact us at response@ardentglobal.com.